Use the drop down menu above to see the available size range. Choose the size you normally wear in a street shoe. The width of these boots is “medium” or “D” width. The sizing seems accurate. 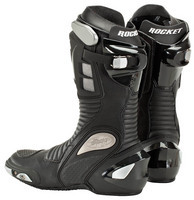 I’d say the overall width and fit through the foot is generous… more like the fit of an Alpinestar boot which is a bit wider than most (Sidi boots are a bit more narrow than most). Got my pair in just 22 days! That's really fast considering all international parcels take 40-45 days to arrive here in Manila. Thanks so much, Motorcyclegear.com!!! I hope all my next purchases will arrive that fast too..or even better! !